The worm wriggles at his feet. Plaything. A muffled groan and a hollow cry. A spell woven to amplify the worm’s emotions. Worth the effort, such was the taste, the sweetness. Too weak to thrash, too awake to lie still. A perfect balance. A symmetry of awareness. He begins the ritual. No easy feat to consume a soul – not exactly child’s play. The necromantic arts came naturally to him. Even still, a great feat to accomplish – and all the sweeter the reward. Anticipation brings its own euphoria, an eager waiting as he walks through the steps he knows by heart. Oh so worth it in the end. Too long since his last. An anxious shaking, a fretful, restless shaking, had taken him over. Sweat, headaches, nervous twitches and shattered concentration – symptoms of the lust. Again the worm wriggled and moaned, steadily regaining consciousness. Perfect. The taste – sweeter when the worm is aware, knows what’s happening as it happens. Twitch. Eyes. Dozens of eyes upon him. He glances here – nothing. He checks there – nothing. But he knows. He knows the feeling of eyes upon him. Perhaps not. He knows the solitude of his holdings. None could learn of this place. Only the dark one himself could know. But the eyes bore into him when he isn’t looking and he can feel them like daggers piercing him from all directions, watching him, seeing him. He remembers this feeling. Meredith and her children – it feels the same when they are around. But they are not here now. He knows this. They couldn’t be. So long since his last taste. The hunger. Nothing more than the hunger. The ritual continues. The hand movements rapid and precise, the words whispered in a long forgotten tongue. The worm wriggles as her eyes slowly open. He gazes into them and sees the familiar sights. Fear. Confusion. Let it be a nightmare. Surely not real, wake up. What is this place? Can’t move. Can’t sit up. Can’t run. Get out. Get up. Why is this happening? Struggle. Fight. Thrash. But the bonds can’t be broken. Not by any mortal. The transfer begins, slowly at first – a drip feed of a soul from one host to another. The first drop – ecstatic. The second drop – euphoric. The familiar feeling, the familiar sound of a worm losing itself, not knowing how to stop it from happening and slowly resigning, giving in to the inevitable fate that awaits it, not knowing what lies beyond though knowing that nothing in this world or any other could keep it from happening, the struggle has led nowhere and the struggle cannot continue and so the struggle ends and the worm yields to eternity. Suddenly a life flashes before his eyes. Not his own, though he has taken it as such: long days in a frigid mountainous land, traps set, game skinned, day by day a life lived solely to survive, the highest calling a worm could fathom – and such simplicity in its weight! – while the world goes on and she toils amongst the snowy cliffs not knowing discontentment, not knowing sadness; for this is the true goal of the worm – to survive – but it is not all hard work and quotidian routine, for there is joy as well; there is joy in a late night rendezvous behind a shed and beyond earshot – a different sort of ritual, one far less precise though no less demanding and no less euphoric – there is joy in forbidden fruit and new love, just as there is joy in familiar love, a calm, settled contentment as day to day life is no longer lived alone, is no longer lived solely for the worm itself, but also for those around it; no longer is the worm required to strive on its own, no longer is she in danger of a lonely death in solitude and far from anyone who means anything to her (thus she believes, for she cannot see the inevitable future that awaits her) – and the joy and the happiness and the day to day contentment of a life lived to the full floods into his heart and his being and his brain and becomes as though it were his, as though he had experienced this joy himself, as if he had experienced this contentment himself and he forgets the pain and he forgets the hunger and he forgets the fear under which he has lived for so long – he forgets who he serves, he forgets to whom he answers and he forgets those who made him this way and at last he knows…. A shriveled husk of a body lays before him now – they look like worms afterward. Dried and shrunken as a worm on a stone on a hot summer day. Light-headed and dizzy, he stumbles toward his bed, still reeling from the sudden rush of another’s life and another’s soul becoming his own. He had never known joy himself except at the expense of others. The boy’s face was taut, emotionless. He betrayed no sign of his thoughts. He always was a good pupil. Razmis looked into the shade’s bottomless eyes, his face blank. “Yes, master,” he intoned. Suddenly the eyes are upon him again – itching, clarwing, scratching at his skin. He can feel the eyes, can feel the gaze as knives slicing through his back. A twitch and he sits up in his bed rapidly. He knows they are there, watching him, seeing him. He looks behind – nothing. He looks around, a full scan of the room and finds nothing when suddenly a blinding flash and a dull ache fill his mind, followed by a sharp, stabbing pain through his skull. He is jostled, shoved, dragged, kicked and beaten, by a force unseen. The eyes are upon him. He is bound, hands and feet, to his summoning circle. He knows the danger this poses and thrashes fruitlessly to break free. He gazes upon his captor: beauty incarnate – the shape of a man, angelic and fierce, otherworldly and alien, yet beauteous and formidable. The angel holds a dagger to the shade’s throat. Hautus’ eyes open wide and a jolt echoes through his stomach. “I see you comprehend how terrible a fate this would be. Tell me what we need to know and you will live, if that’s what you call this dreadful existence,” the angel says, waving his hand at the shade’s hovel. The angel seethes with fury. As he does, Hautus feels his bindings flare, sees them turn agonizingly, painfully white-hot. He stares defiantly into the angel’s eyes, his only courageous act this day. “I cannot, angel,” he says, his agonized voice cracking the veneer of bravery and defiance. “You can!” The angel screams and a glowing, holy fire surrounds the pair, searing Hautus’ skin. Hautus feels the blisters forming on his face, his arms, his chest. Hautus understands, in this moment, the angel’s power. The shade seizes his opportunity. “I CAN,” Hautus screams out. At once the flames dissipate and all that remains is the stench of his own burning, blistered, cracked skin. “I… will… tell… you,” Hautus chokes between breaths. Hautus points to the display above his bed – a shabby wooden rack, upon which sits the light-blue sword he has spent ages perfecting. 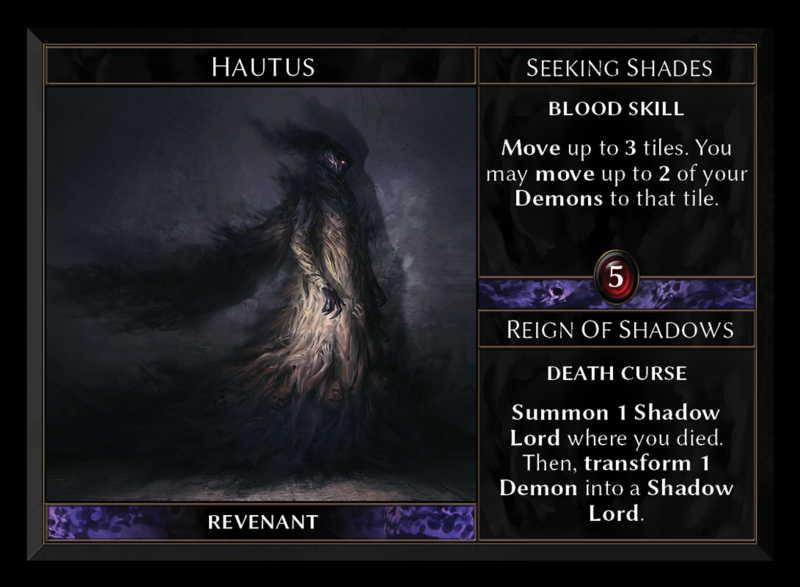 “It… will… destroy… him…” Hautus manages before the pain overtakes him.